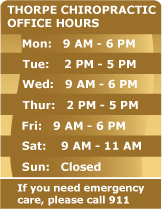 Schedule an appointment by contacting TCO today. How Long Does Chiropractic Care Take to Work? Generally speaking, conditions that have been present for a longer period of time will logically require a somewhat longer recovery time, although there are always exceptions. Our approach is such that the immediate goals are to help you get relief from pain and disability as quickly as possible, while at the same time, addressing the underlying dysfunctions that caused the pain and teaching you strategies to manage and reduce any future episodes that may occur. In this way we attempt to help you expeditiously reduce pain and return to normal function. Do You Think People Should Come in Regularly to Have Chiropractic Check-Ups? Although there are certain instances in which regular, periodic treatment may be recommended, this is usually only seen with chronic cases requiring professional management of their condition. The doctors will likely prescribe certain exercises and other self help efforts that are recommended to you to do regularly, and these are prescribed to help you self-manage your condition. The chiropractic doctors at Thorpe Chiropractic Office place much emphasis on teaching patients self-care strategies so that they can manage conditions themselves, only needing to return to the doctor if these strategies are not successful. Our doctors support and follow evidence-based guidelines in spinal health care, recommending spinal check-ups every 6 to 12 months for all ages. Besides all the benefits of regular aerobic and strengthening exercise, your chiropractic PSP may prescribe other exercises designed to keep joints moving properly or to improve the ability of muscles to stabilize the back or neck and prevent re-occurring pain. For many of these, it will be recommended for you to continue long term, while others are to be used only temporarily while you are having pain. In other words, certain exercises will help your condition to improve more quickly and others will be designed to lessen the frequency of recurring pain. Chiropractic Education: Curriculum Requirements For the Doctor of Chiropractic Degree (DC) in comparison to the doctor of medicine degree and the doctor of physical Therapy Degree (DPT). Chiropractic offers solutions to federal and local governments and to the public and private insurance industry by avoiding unnecessary surgeries. Roughly 200,000 spinal fusion surgeries are performed each year in the U.S...read more here.